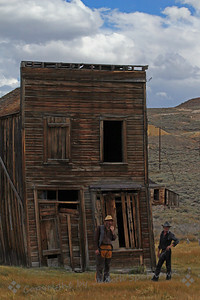 Bodie is probably California's most well known gold mining ghost town. By 1879 Bodie had a population of about 10,000 and was "second to none for wickedness, badmen, and the worst climate out of doors." The remains of the town was designated a state historic park in 1962, and is visited often for general interest and photography. I made a brief visit there in September of 2012. A few photographs exemplify this interesting old town. 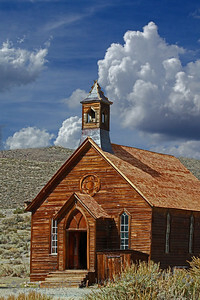 ~ This is the last remaining church in Bodie ghost town. It was originally a Methodist Church. It is on one of the main streets of Bodie, and has interesting details. 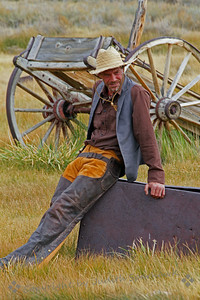 Cowboy and a Wagon ~ Photographed at Bodie, California. 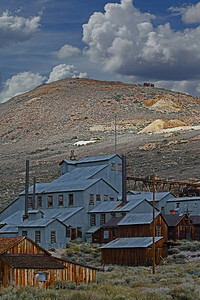 Standard Mine & Mill ~ These buildings are part of the old Standard Consolidated Mining Company, incorporated in Bodie in 1877. This mine yielded nearly $15 million over 25 years. 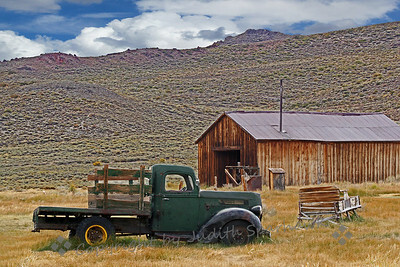 The Old Green Truck ~ This photograph shows an old truck by an out-building, part of Bodie, California. House on the Hill ~ This old house, including the tilted outhouse out back, stands alone on this desert hillside. 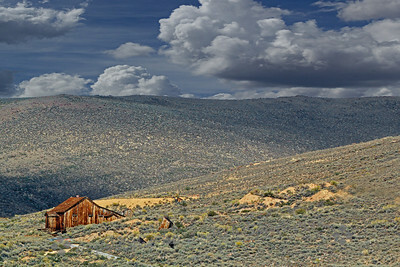 The elevation of Bodie is 8379 feet, on the desert foothills of the eastern Sierras. 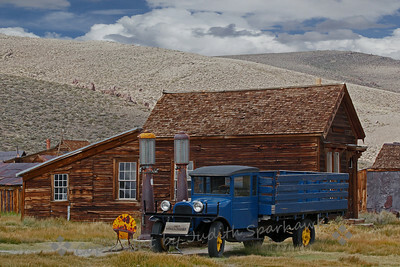 ~ This old 1927 Dodge truck is shown by the period gas tanks and nearby buildings in Bodie, California. ~ This old building has a definite lean to it, and is buttressed on the left side by a large timber. These men in period clothing were hanging out, and didn't mind being photographed.